Crypts & Things Remastered is a sword & sorcery role-playing game built on the Swords & Wizardry Core rules and Akrasia's house rules. I do have the original edition from 2011, but I haven't read it in quite some time, so I will not be comparing the two. Google+, my favoured social media platform, is about to be terminated. Naturally, there is no better day in the calendar to announce that I have signed the Book of the Devil and launched my own Patreon. I will gratuitously accept money thrown at me under the guise that it would help me make more blog posts, although I fully intend to spend all the cash on blackjack and hookers. I've shared half of this post on Google+, but since it'll soon go away, I thought putting it up on my blog would be wise. Heartwarming Sandbox is a project I've been jotting down ideas for from time to time. More similar pieces will follow shortly, some related to the project, some not. A year ago I ran several sessions of Rappan Athuk (using AS&SH for those sweet sub-classes) - 18 sessions out of a 26-session campaign, to be precise. The sessions were 2-3 hours long each, conducted over TeamSpeak. I kept notes and maintained an ugly master sheet for XP and mortality data, of which I was just reminded by a question on Reddit (How many XP do characters bring back per session in your games?). My answer to the question lies in the document hereby shared for all of you kind readers to see. Most of the stuff in there should be fairly obvious, but here are some notes: In the Overview tab the PC and NPC columns show the number of characters present at a particular session, whereas in the Mortality tab the Sum columns have the number of PCs/NPCs present up to that point combined for purposes of lethality calculations (given in the mW columns). In the XP tab the "Loot XP %" value notes that over the course of these 26 sessions about 60.69% of XP came from treasure. Here are a bunch of blog posts (chiefly from January and February) that I found particularly noteworthy. Olav Nygård has shared a simple procedure to create "Guess who?" style investigative scenarios, along with two examples. Anthony Huso is playtesting his low-level planar module for AD&D/OSRIC. His second session report is especially noteworthy because it sheds light on the importance of playtesting (the same rigorous thought process is also there in the comments while discussing the modified Incantrix class). Courtney Campbell has written a good reminder about ten things you can use in a dungeon to increase your survivability. After about 50 sessions (or 200 hours), Skerples presents his thoughts about the mechanical bits of GLOG. 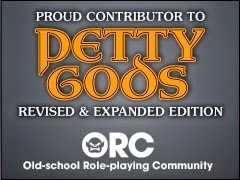 Alex Shroeder shares his thoughts regarding advancement in RPGs. Anne has been on fire lately. She uncovered most of the blog posts that comprised Secret Santicorn 2018, made a list of a gazillion of people making actual play reports, and analysed the ability scores we all use, love, and hate at times. Dale Houston has talked about how he organises events in his megadungeon campaign using simple d6 tables. Angus Warman has shared his set of GLOG-esque house rules, called Die Trying (without classes and levels, too!). While you're at it, also check out his travel rules. The Lawful Neutral has blogged about the initial thoughts of a mega barcrawl and a bunch of suitable monsters. Chris Kutalik made an excellent summary for his Hill Cantons sandbox campaign setting with lots of links and references. Dungeons and Possums posted a great list of free resources to start playing (and running) old-school games. By the way, the blog also has a superb index, in case you want to poke around. Sometimes we all need to be reminded of the other British accents, and noisms just does that using football fan interviews off YouTube. Martin O. has shared 10 very flavourful bandit gangs. Talysman has summarised his rules regarding search rolls and similar mechanics. red_kangaroo made a memory system (for spells, languages, memories, martial art techniques, etc.) using slots similar to how slot-based inventories work. I especially like how Trauma is handled like Fatigue, eating up slots. Emmy Allen has blogged about her next Ynn-like thing: the ruined market of Sharne. Just a rather lazy post for today: a weather table I originally wrote for Grim Tales, but I will probably utilise in my Heartwarming Sandbox game.